I have been a serious potter for about 4 years. Most of my work is wheel thrown, but I do have some hand built pieces too. I love to add texture to my work using hand made clay stamps on cone 6 white stoneware. My inspiration for my textures comes from growing up in a home of a quilter and wanting to make the prints on the fabric come to life. My works are expression of my emotions, joy and sadness mingling with confusion and knowledge. The bold contrasts and simple poses express the knowledge that the feelings of sadness, loss, and confusion can be interlaced with bright lights of hope, the deep sense of peacefulness that wisdom brings, and the contrast of our varying emotions moving through us as we try to find closure and understanding when all else seems lost. I use pinch pot, coil, and slab built techniques to create pieces that express the thoughts, reflections, emotions and feelings. A variety of under glazes and glazes are used to enhance the finish. Sheri Heiland studied ceramics at Iowa State University and Central State University in Edmond, OK. She was honored to apprentice with Karl Christianson of Wilton, Iowa before he retired. She has been a potter for over 30 years and has been the resident potter in the Cultural Center at the Iowa State Fair for the past 16 years. Her work is mostly functional with a few bits of whimsy thrown in. Until she moved 4 years ago, Sheri worked with high fire stoneware. She is currently exploring a new pallet of glazes while firing in an electric kiln at lower temperatures. My work references the Korean and Japanese folk pottery traditions and their influence on pottery making in the west during the last half-century. I make vessels that are intended to be used in the preparation and serving of food and drink, and the beautification of one's surroundings. 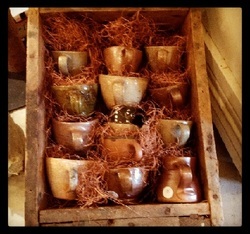 My journey in pottery began in a ceramics class during my sophomore year in college in 1972. After college, I took the occasional pottery class and eventually became a "basement potter". In 2001, I, along with a few other local artists, had the opportunity to establish an artists' cooperative, Creative Artists' Studios of Ames (CASA). So, while making pots is quiet and personal experience I want to be reflected in the pots themselves, I now am also a potter in a community of potters and artists working in a variety of media and working alongside both students and peers. It is now hard to imagine myself as a solitary potter. Every day I share resources, experience, and perspective with my fellow artists. As part of a university community I've been given many opportunities to teach students with diverse talents and backgrounds. Teaching has let me experiment with new ideas and perspectives, challenging myself at the same time as I challenge my students. Being a potter is a very balanced profession. As a potter I am a designer, a maker, a business owner, a laborer, a chemist, and a physicist. I love throwing, trimming, pulling handles, glazing and firing. And so, the journey begun forty years ago continues as I strive to create pottery that is fresh and alive in its form, color and surface, and performs its intended function well. I believe a substantial part of the beauty of handmade pottery lies in its use, and the pottery I create is intended to take an active part in one's daily life. My wish is that you will incorporate my pottery as a part of your daily life and that you will sense the excitement and pleasure that I have enjoyed in making it. Marion creates functional fine craft ceramic art that is wheel thrown and altered. She looks for inspiration in the human figure and in nature. Human gestures and curves are subtly reflected in her shapes; the curve of a waist, the bend of an arm. An intimate gesture completes the piece; the hand that picks up a cup, pulls it to the lips and drinks. Following form and function, timeless stoneware and porcelain pieces are created with the intent to be used every day. Marion has been honored to have work published in "500 Plates and Chargers," by Lark Books and currently works in a studio in Des Moines, where she lives. Enjoying the process of hand building, I construct simple yet interesting slab forms to create both functional and decorative pottery. I find beauty in nature and simple objects that have the ability to be reused and transformed into texture and surface design when pressed into clay; I incorporate prairie grasses to create miniature landscapes and thrifted doilies to mimic the intricacies of the natural world. My work tends to look 'earthy' as I have chosen to use brown clays and often celebrate the material by leaving portions unglazed. The raw clay color and texture adds another layer to a decorative piece that may be partially glazed, typically with a brown or green glaze. I primarily fire my work in an electric kiln, but wood fire whenever I can. Over the years, I have noticed that as I spend more time in my garden, my work has naturally evolved beyond nature-inspired surface design to embrace nature-inspired function as well: budvases, planters, and garden markers are new additions to the list that already consisted of vases, prairie grass wall boxes, and stamped trays. Of course, one must also include the cups and plates that complement the harvest! Housed in a new shop downtown on 2nd Street in Perry, Eric Peterson is known for his functional kitchenware as well as wood fired pottery and local material glazes. The barn houses both a gallery and working studio. Dan graduated from High School in Garnavillo, IA in 1968 and attended Luther College in Decorah, IA where he studied Art with a concentration in Ceramics under Dean Schwarz. Following graduation with Dean's recommendation, Dan enrolled at Pond Farm Pottery in Guerneville, CA where he studied under the master Potter, Marguerite Wildenhain. Dan balanced a career as teacher and studio potter. Dan retired from teaching in 2003 and now devotes his time to making pottery. Dan has exhibited in many shows. Most notably the 2002 "Ripples Exhibit" which was shown in three venues in the United States, The Legacy of Marguerite Wildenhain in Sabastapol CA. His work is in the collection to the Mcnider Museum in Mason City, IA, The Pond Farm Collection at Luther College, the Nobles County Art Center in Worthington, MN, The Stinsen Prairie Arts Council in Algona, IA, and many private collections. My husband and I have been potters for almost 40 years. We have had a retail store in West Des Moines, exhibited at art fairs across the country, and sell our work to a wide variety of shops and galleries. Currently we are using thrown stoneware shapes as a canvas for slip-trailing, as well as adding faces and animal. I trained in a Victorian country pottery in the North of England, and my ware carries on the tradition of useful craftsmanship, the forms influenced by natural structures and classical architecture. My pottery is meant for everyday purpose and enjoyment, and is naturally lead-free, microwave and dishwasher-proven.